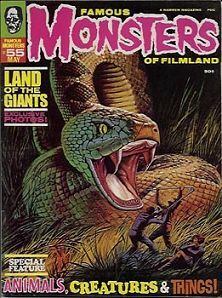 May 1969 issue of FM featuring "Land of the Giants" on the cover. This issue also features an obit article on Jack Pierce, the Universal Studios monster make-up man. Mint condition. Jack Pierce was, according to Boris Karloff, "the best make-up man who ever lived". Pierce created the make-up for Karloff's Frankenstein monster and the Mummy, Chaney Jr.'s Wolfman, and many others. He died in obscurity, his last job being the make-up duties on "Mr. Ed"(!!!???) It was a shame that only a handful of people attended his funeral. Website design and hosting by Sohodojo Business Services. Item 153 of 466 items displayed in viewer. 0 items in cart.